Thanks! 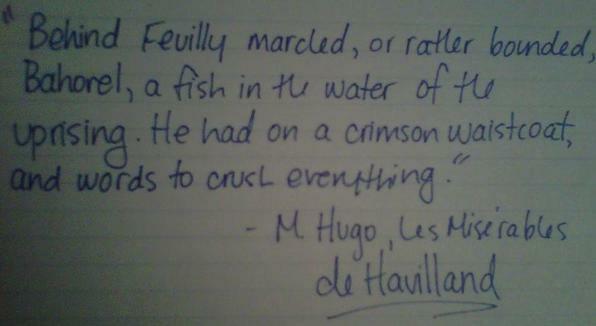 I take all my notes and write in red and black, and I think a few others have caught on to it. It just feels right. When I started to learn to write in cursive, my handwriting looked a lot like yours!! Oh, yeah. I guess I still have not formed my own style yet. That's how my school wants cursive done, it's probably easier for teachers to read if everyone uses the same style or something. I variate between trying and not trying (which is a mess). Morgan: Your handwriting looks like it came out of another century and it is gorgeous! Rebus: I love your handwriting, and thanks for sharing your home language too! Sami: Your handwriting is so neat and clean and I love it. MamzelleCombeferre wrote: Morgan: Your handwriting looks like it came out of another century and it is gorgeous! Zella stole my words for all of you. And Morgan, I love, love, love your handwriting. Here's my favourite quote. I write it in two languages. Musicalfan, your handwriting is great! It's so neat and collected. And yours, Sami; it's just generally cute, and Rebus, I love both styles you did, but the first is especially beautiful. Ah, Morgan. 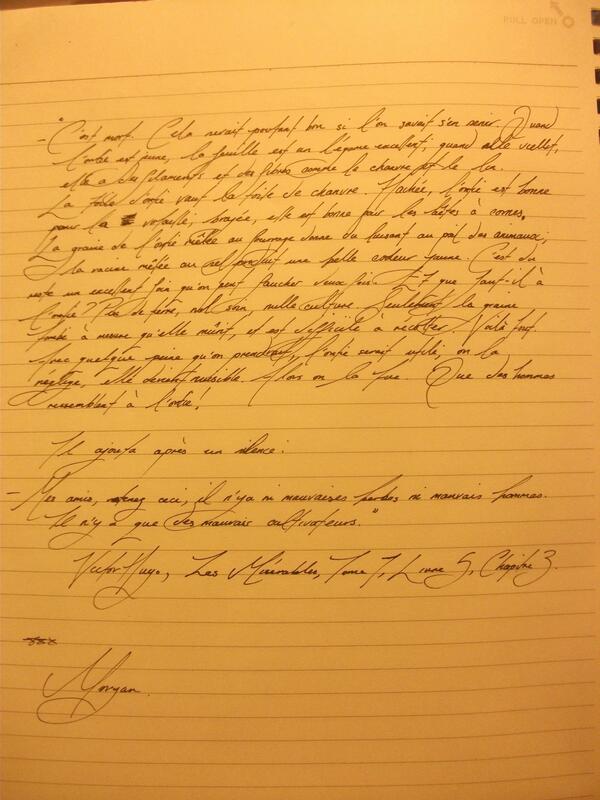 You have know shown me your flourishing handwriting, and I am now even more intensely jealous. Honestly, it's stunning. The Mandatory bad handwriting submission. And yes, this is me making an effort. deHavilland wrote: I apologize, because I leafed through intending on doing the one about Prouvaire being yet intrepid, and then my thumb landed on this and I thought, "ah, good, charming, yes."